For the second straight opening-trading day of the week, the major averages fell sharply. And why did equities fall, with the Dow Jones Industrial Average (DJIA) falling more than 400 points at its low point of the day? Earnings, earnings and revenues! But here’s something interesting that also happened on Monday and akin to the prior week’s opening trading day (Tuesday due to the Holiday shortened trading week). 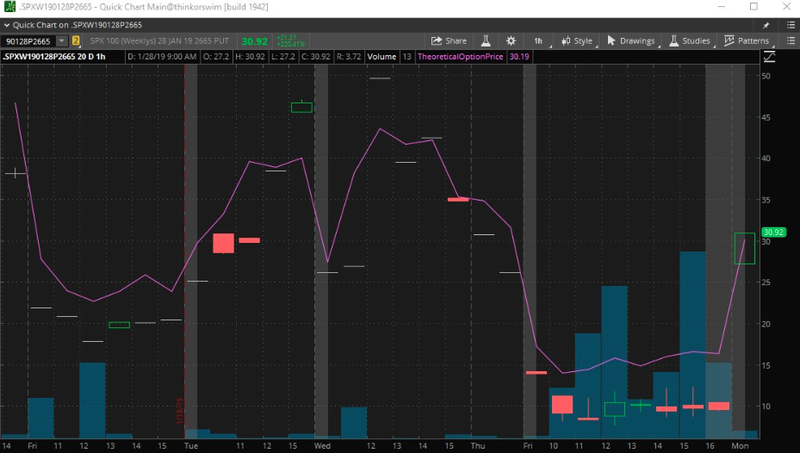 The chart above indicates that this was the 2nd week in a row that the ATM puts tripled on the 1st trading day/morning of the week and after volatility/VIX got slammed on Friday the previous week. What this tells us is that despite the market’s January rally, investors are still “panicky” and betting on the market’s moving lower via hedges. Consequently the action in the .SPX puts found volatility sharply higher on Monday. Moreover, let’s get right to those disappointing earnings before moving on to some of the more pressing macro issues of the day. Be it Apple’s (AAPL) earlier revenue warnings or Catepillar (CAT) and Nvidia’s (NVDA) latest earnings miss and warnings, they seem to all point directly at China’s slowing economy. On Monday, Caterpillar shares fell 9.1% after the industrial giant posted weaker-than-expected earnings for the fourth quarter, and issued disappointing guidance. 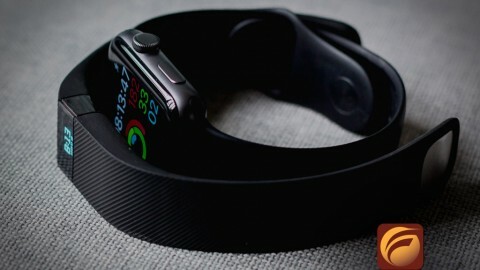 The company said specifically that its sales in the Asia Pacific region declined because of lower demand in China. Nvidia, meanwhile, dropped 13.8% Monday and after slashing its fourth-quarter revenue guidance to $2.2 billion from $2.7 billion. The chipmaker said “deteriorating macroeconomic conditions, particularly in China,” impacted demand for its graphics processing units. Margaret Yang, market analyst at CMC Markets, said the guidance from Caterpillar and Nvidia paints a weaker outlook for the peak earnings season. “The trade and growth uncertainties surrounding markets over the past few months has started to materialize and Trump’s trade policy has resulted in adverse economic impact to even the American companies,” Yang said in a note. 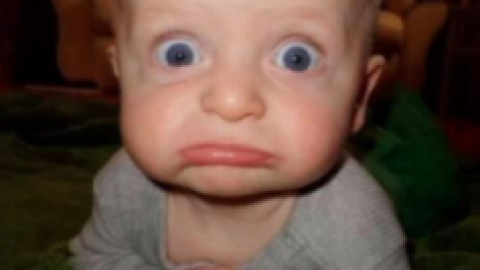 Goldman Sachs in a Friday note warned its clients about companies with big revenues from China. In addition to Nvidia, it called out Broadcom, Micron Technology, Qualcomm, Qorvo, Skyworks Solutions and Wynn Resort. The uncertainty about the outcome of trade negotiations between U.S. and China remains high, and the conflict could escalate again in the second half of this year, Haibin Zhu, J.P. Morgan’s chief China economist and head of China equity strategy, said in the bank’s report. With key earnings reports already disappointing for the Q4 2018 period, the S&P 500 is forcing investors to reflect on the December market decline and recognize it’s nature of foreshadowing the future. 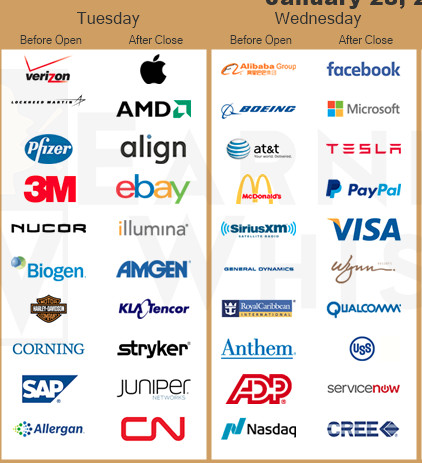 And earnings will remain top of mind throughout this week with big earnings reports expected from tech titans and with Exxon Mobil (XOM) closing out the earnings week. 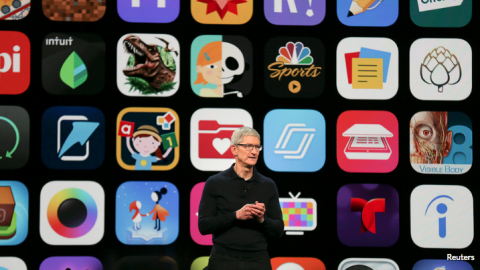 About 252, technology-laden Nasdaq components, or about 9.6% of the index, is scheduled to report earnings this week and none more important than Apple Inc. After the closing bell today, investors will get a full report from Apple Inc. that includes Q1 2019 results and forward guidance. Finom Group has been suggesting the probability of a market pullback near-term remains elevated. The market is seemingly overbought although forward 12-month P/E valuation is reasonable and below the 5-year average. 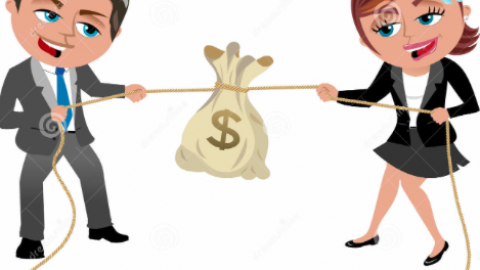 With the major averages churning in the previous week and falling at the onset of the present trading week, earnings and the FOMC meeting/press conference will dictate the market’s next leg higher or lower. 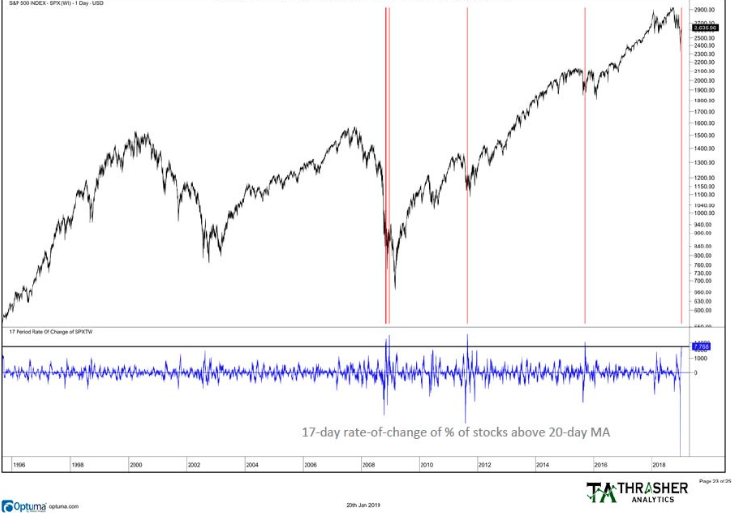 According to Thrasher Analytics, if we simply look at the internals of the S&P 500 we’re forced to recognize that a pullback has historically happened when a large increase in the percentage of stocks rose above their 20-day MA. (See chart below) This has happened just four times and each saw the market eventually give back gains or retest a prior low. Keep in mind that a retest is not necessarily defined as touching the former low, but rather pulling back toward that low before moving higher once again and above the 100 and 200-DMAs. 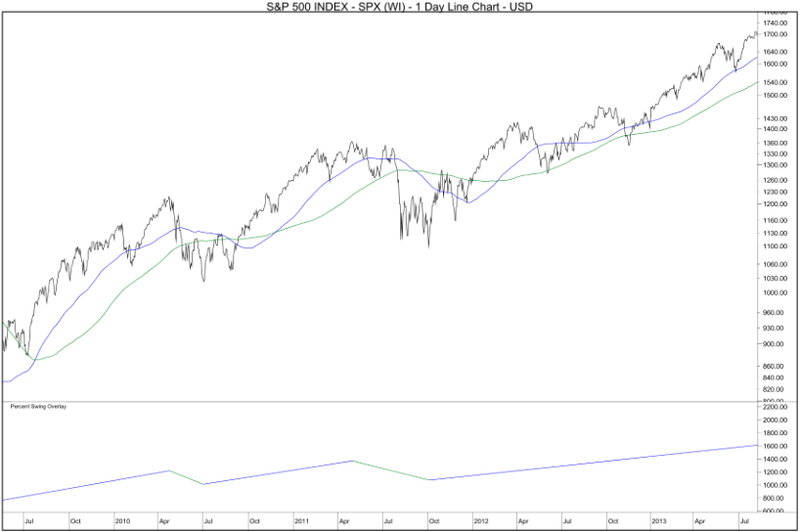 The S&P 500 remains narrowly above its 50-DMA and has closed above the 50-DMA for several sessions now. But more importantly as it pertains to forecasting the markets next move are the 100 and 200-DMAs. Why? Going back to 1960, after a 15+% decline while the market has remained below its 100-DMA and 200-DMA, the risk of a retest or a lower high were high. But once we cleared these intermediate and long-term DMAs only then did the risk diminish. The most recent examples of the retest thesis came in 2010 and 2011. In 2010 there was a lower high after the S&P 500 tested its 100-DMA (blue line) and in 2011 the retest was accomplished while price was under both 100 and 200-DMAs and a higher low was finally put in after a test of the 200-SMA (green line). Once price was above both these indicators then the up trend was able to continue. We can go all the way back to the 1969 decline and find the same example whereby when the S&P 500 declined 15%+ and remained below the mentioned DMAs, it retested its lows or found a higher low. The 200-DMA is roughly 3% above Friday’s close with the 100-DMA a few points lower. The market’s current counter-trend strength is normal within a downtrend, something we’ve mentioned in our research reports. Nonetheless and as we look toward the market’s next leg, when these rallies occurred with price still under these DMAs, the risk of a continued trend lower were still at heightened levels. In other words, what looks like a risk-on market environment based on breadth and price movement might be better characterized as a risk-neutral environment until the 100 and 200 DMAs are achieved and held above. It’s all about risk folks and history can certainly aid in managing risks. What we’d rather not see happen is finding investors chasing the market while it is within a path of resistance. Additionally, the macro concerns remain elevated. The market meltdown that wiped out stocks’ gains late last year could easily give rise again if forward earnings continue to decline or come into greater doubt. 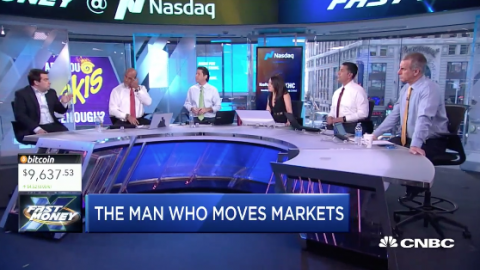 According to Daniel Pinto, co-president of J.P. Morgan Chase and head of its massive corporate and investment bank, last year’s end-of-year market swoon is a likely occurrence in 2019. Overall, Pinto said he actually prefers the current market to the pre-financial crisis environment. Instead of continually rising markets, leading ultimately to euphoria and then massive collapse, it’s in a period of rolling corrections that has reined in expectations for corporate profits, he said. This is a critical week for the market rally as headlines from earnings, trade and central banks continue to roll in daily. Given the year-to-date rally and all the noise, if the market can sidestep the potential pit falls that come from such noise, the upside potential for the market is promising, as many funds will look to add risk. If benign conditions endure, large funds could start sinking as much as $45 billion into stocks according to Deutsche Bank and Wells Fargo. A key element to the thesis is a continuation from market volatility easing. 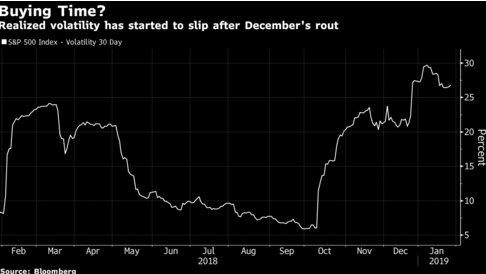 If volatility continues to subside, these strategies could steadily re-risk,” wrote Pravit Chintawongvanich, equity derivatives strategist at Wells Fargo, which estimates their assets at $400 billion. If historic three-month price swings ease to 15%, these funds could hike their equity allocations by $13 billion per month, or about $40 billion over three months. Deutsche Bank AG strategists led by Binky Chadha also see $40 billion to $45 billion of buying from specific funds that are triggered by vol-risk, as long as price swings continue to subside. 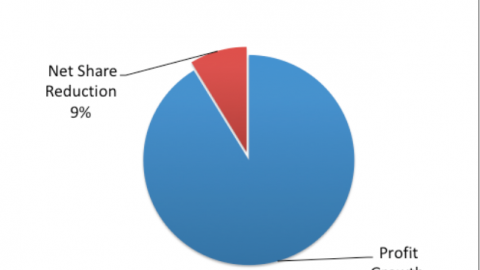 They reckon vol-control portfolios are about mid-way to their full equity allocations. Certainly we could delve into other market and geopolitical headlines that include new sanctions levied on Venezuelan oil exports and the recent developments between the U.S. Justice Department and Huawei, but to that extent we’ll just leave investors with the key headline below. The U.S. Department of Justice filed criminal charges Monday against Meng Wanzhou, the chief financial officer of China tech giant Huawei and the daughter of its founder and president Ren Zhengfei. Acting Attorney General Matthew Whitaker confirmed during a press conference that the Justice Department is seeking the extradition of Meng Wanzhou from Canada. The Justice Department also announced charges Monday against Huawei for allegedly stealing trade secrets from T-Mobile. The charges stem from a civil trade secrets lawsuit filed by T-Mobile in 2014 over a robot called “Tappy,” which was used in testing smartphones. Noise, noise and more noise! What investors should be paying greater attention to are the upcoming Fed rate announcement and subsequent press conference, not to mention actual earnings results. If we look at yesterday’s market sell-off, it actually wasn’t that bad in retrospect. I mean the earnings miss from Caterpillar and Whirlpool after the close were meaningful. Couple those results with the warning and guidance cut from Nvidia and the Nasdaq was off a little over 1.1% while the Dow and S&P 500 were down less than 1 percent. Not too bad. Why didn’t the market react worse than it had? Mad Money host Jim Cramer explains that even with Caterpillar’s disappointing results, most of its weakness came from China and even with its lowered expectations it forecasted just a FLAT year from sales out of the region, not a decline. As it pertains to Nvidia’s negative guidance, most think the semiconductor sector has priced in weakness going forward. Ultimately, Cramer suggests that investors still want to believe in the market and thus the market has proven resilient even with many issues and macro-situations left unresolved. 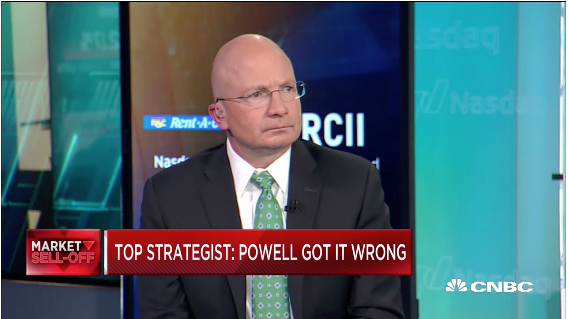 But Morgan Stanley’s Mike Wilson suggests optimism may be misplaced and timing may prove more critical for investors in 2019. 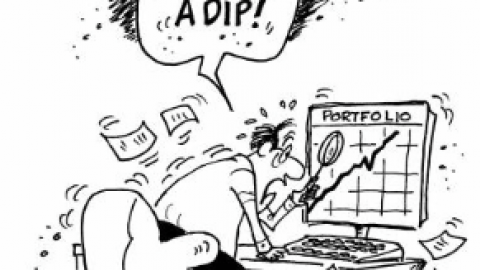 Wilson on Monday urged his clients to “dismount” as the market’s rally since late 2018 is starting to look precarious. Wilson isn’t convinced that the momentum will last, as he believes double-digit profit growth has come to an end and low single profit growth is at-hand. 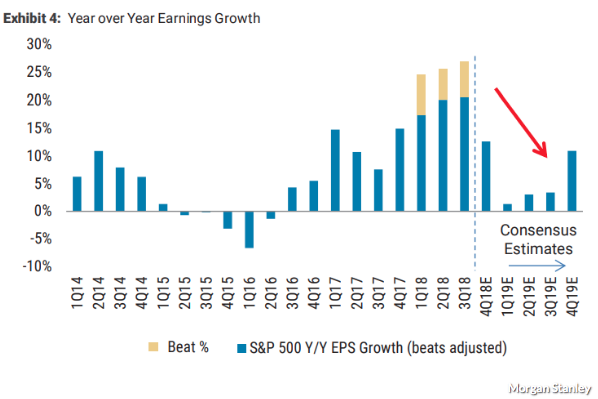 In fact, he is projecting earnings per share, or EPS, to grow between 1.3% to 3.5% in the first three quarters of 2019. “Tapering is still tightening though and the longer it extends quantitative tapering and the lower the target for the final size of the balance sheet, the less positive it will be for equities. 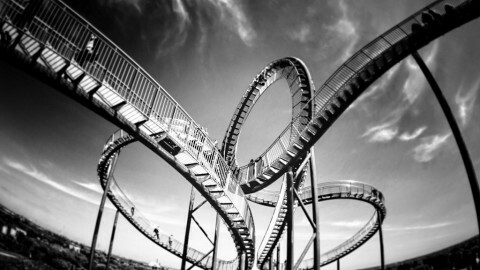 Tread carefully over the next couple of trading days as it could prove a bumpy ride. There’s nothing wrong with waiting to see how things play out in the market and/or protecting your portfolio for the long haul.